THOMPSON, DAVID, fur trader, explorer, surveyor, justice of the peace, businessman, and author; b. 30 April 1770 in the parish of St John the Evangelist, Westminster (London), son of David and Ann Thompson; d. 10 Feb. 1857 in Longueuil, Lower Canada. David Thompson’s origins were humble, his final years spent in poverty. 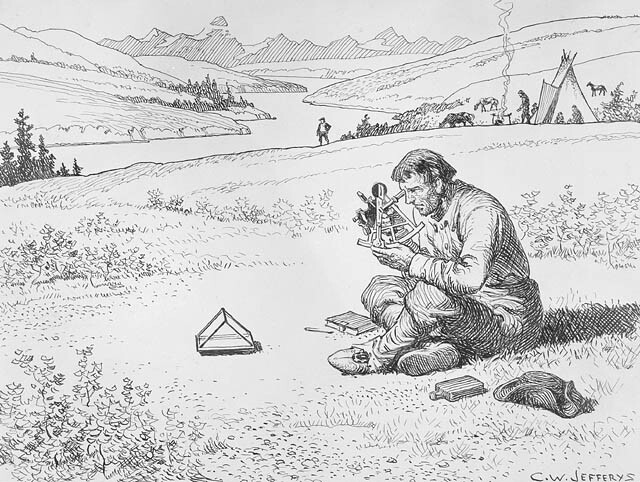 Yet, as an explorer and surveyor, his work has earned him a reputation as one of the best pioneering geographers in North America. His parents had only recently migrated from Wales to London when he was born and less than two years later his father died, leaving David, his mother, and a younger brother, John, in financial difficulty. At age seven Thompson was admitted to the Grey Coat Hospital, a charity school established to provide a moral and practical education to the poor children of Westminster, and, once accepted, he appears to have maintained little direct contact with his family. He was subsequently enrolled in the Grey Coat mathematical school, where he received a rudimentary training in navigation, and on 20 May 1784 he was apprenticed to the Hudson’s Bay Company for seven years. Thompson’s first year with the HBC was spent under Samuel Hearne* at Fort Churchill (Churchill, Man. ), the company’s most northerly post on the western shore of Hudson Bay. Thompson remembered the year as one spent in little productive activity, yet his experience copying parts of the manuscript of Hearne’s A journey from Prince of Wales’s Fort must have stirred his imagination and sense of adventure. In the fall of 1785 the London committee of the HBC ordered Thompson down to York Factory and he made the 150-mile trip south on foot with two Indians, living off the land. At York, despite orders from London that he be “kept from the common men and employed in the writings, accounts and warehouse duty,” Thompson spent at least part of the winter at hunting camps with the labouring servants. This was a practical experience that offered a welcome break from his clerical duties assisting the irascible chief at York, Humphrey Marten*, or the newly appointed writer and accountant, Joseph Colen*. Thompson was sent inland in the summer of 1786, and in September he left Cumberland House (Sask.) with Mitchell Oman, an able but illiterate Orkneyman, and 13 others to establish South Branch House (near Batoche) on the South Saskatchewan River. At Cumberland House the following summer he appears to have perfected a working knowledge of the Cree language, an essential skill for a prospective fur trader in that region. The chief at this post was George Hudson, a former Grey Coat Hospital boy and apprentice whose moral and physical deterioration served Thompson as a lasting object-lesson on the dangers of long isolation. During that summer Thompson also underwent a religious experience which he described as a game of draughts with the devil. The experience had a strong influence on his conduct for the rest of his life and confirmed him in his abstemious habits and pious beliefs. Thompson remained inland in 1787 and 1788, serving under William Tomison* at Manchester House (near Standard Hill) and James Tate at Hudson House (near Brightholme). He passed the winter of 1787–88 with Peigan Indians in the Rocky Mountain foothills and learned their language. Back at Manchester House in the fall of 1788, he seriously fractured his right leg on 23 December in a sled accident. Severe swelling made it impossible for the leg to be set properly, so it healed slowly despite the best care that Tomison, who had taken a paternal interest in Thompson, could provide for his young protégé. In the spring he was carried down to Cumberland House where he was gradually nursed back to health. By the end of the summer of 1789 he had regained enough strength to move around with the help of crutches, although he was not ready to withstand the voyage back up the river and was left to spend the winter at Cumberland House. This proved to be a major turning-point in Thompson’s life. In early October, soon after the canoes had proceeded upriver, Malchom Ross*, master at Cumberland, and Thompson were joined by the surveying party under Philip Turnor*, who was being sent into the Athabasca country. 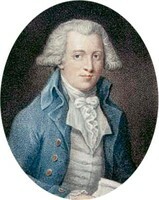 Both Thompson and Peter Fidler* studied mathematics, surveying, and astronomy with Turnor during the winter of 1789–90. By the spring Thompson had not yet recovered his strength and, to make matters worse, he had lost the sight in his right eye. As a consequence he was not considered by Turnor for the expedition to Lake Athabasca. Instead, Fidler and Ross were chosen to complete the party. Thompson was sent down to York Factory to finish his apprenticeship under the direction of Colen, who had replaced Marten as resident chief there. Turnor’s choice appears to have been a severe blow to Thompson’s youthful pride and he never fully forgave Ross or Fidler for being selected in his place. To his credit, Thompson was determined that his training under Turnor should not be wasted. His interest in surveying and astronomy had been thoroughly aroused. On 30 Aug. 1790, shortly after his arrival at Hudson Bay, he wrote to the secretary of the company in London offering to make observations along the coast and requesting a sextant, parallel glasses, and nautical almanacs in lieu of the suit of clothes normally presented to an apprentice on the completion of his indentured term of service. 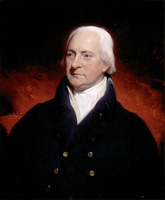 Over the next year, when not busy with his duties as clerk or writer, Thompson carefully worked up the survey observations he had made while travelling from Cumberland House to York Factory and he submitted them to the London committee with a further request to be sent on surveys. Thompson’s letters were well received. Upon completion of his apprenticeship he was formally offered the usual first contract as a writer for three years at £15 a year, and in a series of private letters he was encouraged to pursue his interest in surveying. Furthermore, his request for surveying instruments was granted. He therefore had every reason to hope that he would soon be recognized as surveyor for the company and he probably contemplated replacing Turnor in that position. It was not a vain hope. 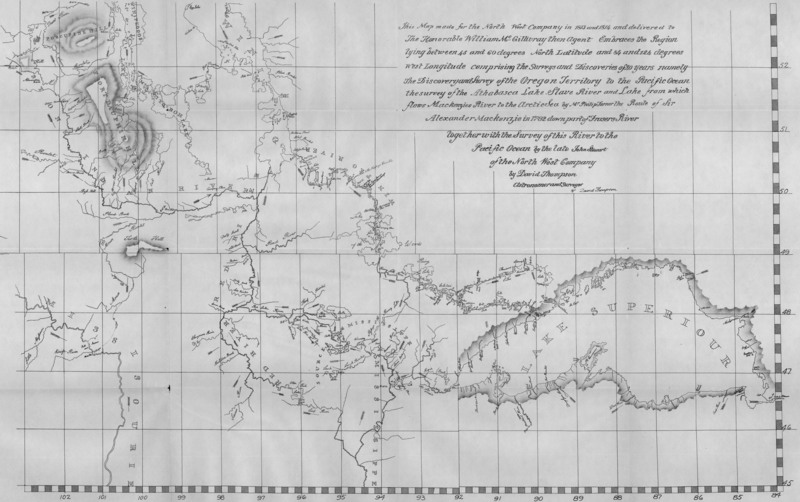 In the fall of 1792 he was instructed by Colen to follow up on Turnor’s work in the Athabasca with a survey of the waterways through the Muskrat country between the Nelson and Churchill rivers. This survey was to provide information about communications in the area, a new arena of competition between the HBC and the North West Company, and about the rivers flowing through it, which were believed to provide a more direct route to Lake Athabasca by way of Reindeer Lake. After wintering at a post he built on Sipiwesk Lake (Man. ), Thompson surveyed a route to the Churchill by way of Burntwood River, noting the locations of wintering posts of both companies. Unable to proceed to Reindeer Lake without a proper guide, he returned to York Factory. The London committee had been convinced by Turnor of the importance of establishing posts in the Athabasca country to compete effectively with the Nor’westers and in May 1793 it sent instructions to Ross to conduct an expedition into that region. The route Thompson had partially explored was circuitous and still unproven so Colen decided that the planned expedition should use the NWC route from Cumberland House to Île-à-la-Crosse (Sask.) and the Methy Portage (Portage La Loche). Since it was too late to begin the expedition when the committee’s instructions arrived, Ross passed the winter of 1793–94 at Cumberland House preparing for a start in the spring. Thompson was sent up the Saskatchewan. He arrived at Manchester House on 28 October, a few days after it had been sacked by a band of Fall (Gros Ventre) Indians, and he rode directly on to Buckingham House (near Lindbergh, Alta). Any plans for exploration that winter appear to have been abandoned because of the unsettled relations with the Indians. He spent the winter at Buckingham House and in the spring of 1794 returned to Cumberland House, surveying those portions of the North Saskatchewan River not already mapped. 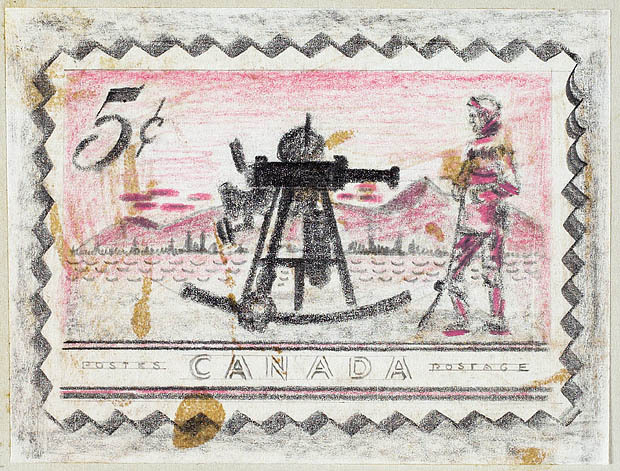 Ross and Thompson, who was to accompany Ross as his assistant, were forced to abandon their plans to proceed from Cumberland House to Lake Athabasca when the canoemen refused to proceed on the expedition without new contracts at a higher rate of pay. Tomison, now inland chief, would not promise the higher rates, arguing that he did not have authorization from London to do so, but Colen and most of the other HBC officers believed that Tomison was opposed to the project out of fear that it would weaken his position. Convinced that Tomison would never willingly support an expedition from Cumberland House, Thompson and Ross decided to pursue the alternate route through Reindeer Lake. Accordingly, in June they headed off with the few servants specifically assigned to them over Cranberry Portage (Man.) and on to Reed Lake, where Ross settled down for the summer. Thompson continued northeastward to York Factory to obtain the additional men and supplies needed for the expedition. There he was delayed 21 days by the late arrival of the supply ship, and, by the time he arrived back at Reed Lake on 2 September, it was too late in the year to proceed any farther. In the spring of 1795 Thompson, armed with the knowledge that he had been appointed HBC surveyor at the handsome salary of £60 a year in May 1794, returned with Ross to York for men and supplies. At last it seemed as if the long-delayed Athabasca expedition would get off the ground. Starting up the Nelson on 18 July, they were only able to reach the Churchill River before they had to set up quarters for the winter: Thompson at Duck Portage (Sask.) on Sisipuk Lake, and Ross at Fairford House near the mouth of the Reindeer River. Finally, in 1796, while Ross went down to the bay for a new outfit of supplies, Thompson dashed north from Fairford House with two young Chipewyan guides and reached the east end of Lake Athabasca. The six-week return trip was accomplished under difficult and sometimes hazardous conditions. The route surveyed, however, proved to be a major disappointment; barely passable in the early summer with a small canoe, it was impassable when Thompson and Ross attempted to reach Lake Athabasca in September with three large canoes loaded with trade goods. As a consequence, they were forced to spend an unproductive and uncomfortable winter at Bedford House, a post they built on the west side of Reindeer Lake. By spring Thompson had arrived at his momentous decision to leave the HBC for the NWC, and on 23 May 1797 he set out from Bedford House to walk to Alexander Fraser*’s post on the Reindeer River. Both the morality of this action and the reasons for it have been the occasion for some controversy. Thompson has been justly criticized for leaving without giving the year’s notice required both by his contract and by courtesy to his employers, who would have been left without anyone to replace him if Ross had not agreed to postpone his planned retirement. Thompson’s later claim that he left because he was ordered to cease his work as a surveyor cannot be substantiated, but one can understand how he might have come to that conclusion. 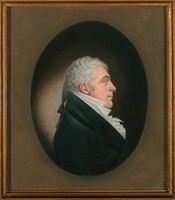 In the summer of 1796 he had been nominated to replace Ross as “Master to the Northward” and in that position his primary responsibility would have been the management of a successful fur trade. His motives for going to the NWC were probably not financial because his recent promotion within the HBC would have placed him in a position to earn substantial bonuses and would have facilitated further advancement. That he harboured personal grievances against his employers and superiors is clear from letters he wrote soon after arriving at Fraser’s post, but in balance they appear insufficient in themselves to motivate such a decision. They may, however, have been necessary from a psychological perspective to give Thompson the moral sanction he needed for the break he was making from close and long-standing personal ties with the company that had been like a family to him. Thompson now began 15 years of productive work with the NWC. In 1797 the as yet unresolved question of the boundary between British and American territory west of Lake of the Woods, underlined by the terms of Jay’s Treaty in 1794, was cause for concern among the NWC partners and, at the meeting of agents and winterers at Grand Portage (near Grand Portage, Minn.) that summer, Thompson was instructed to make a survey westward along the 49th parallel, considered the most likely boundary, and to chart the position of NWC posts. He worked at a hectic pace, completing in 10 months an exploratory survey of the major rivers and lakes from Lake Superior to Lake Winnipeg and on to the Swan River valley, then south along the Assiniboine and Souris rivers and overland to the Mandan villages on the Missouri River, back to the Assiniboine and up the Red River, across to the headwaters of the Mississippi, then over the divide to Lake Superior by way of Fond du Lac House, and finally along the south shore of Superior to Sault Ste Marie and back to Grand Portage. His conclusion that the Mississippi had its source in Turtle Lake (Minn.) was but a few miles off and his observations constituted by far the most accurate information on the headwaters of the river gathered to that date. The amount of work Thompson had accomplished in one year was prodigious, and had been possible only because he had been relieved of other duties and given all the logistical support he required – a marked contrast to his experience in the HBC. The methods he employed were those he had learned with the HBC and his observations were taken with the instruments he had received while an employee of that company. The maps he later compiled were based on a series of fixed points, usually trading posts, located by means of astronomical observations for latitude and longitude. Waterways and other natural features between these key points were traced according to rough observations of the routes he followed. His calculations of latitude and longitude were usually fairly accurate, given his equipment and methods, and are a tribute to his care and diligence in taking multiple observations whenever possible. Direction of travel was established by compass and distances were usually estimated on the basis of elapsed time; these observations, especially his estimates of distance, show considerable inconsistency. His visual perception of distance was undoubtedly affected by his partial blindness. In 1798 Thompson travelled through the English (upper Churchill) River department up the Beaver River (Sask.) to Red Deers Lake (Lac la Biche, Alta), where he established a trading post and spent the winter. In early spring he travelled overland to Fort Augustus (Fort Saskatchewan) and from there he investigated a new route from the North Saskatchewan River to the upper part of the Athabasca River by way of Lac la Nonne and the Pembina River. He then followed the Athabasca River to the Clearwater River (Sask. ), from which point he took the usual route over Methy Portage down to Grand Portage. On the way he stopped at Île-à-la-Crosse where on 10 June 1799 he married, according to the custom of the country, Charlotte Small. Charlotte, the mixed-blood daughter of retired NWC partner Patrick Small, was only 13 years old, but she was to become Thompson’s lifelong companion in a relationship that greatly exceeded the norm for country marriages in closeness and stability. During the next few years Thompson’s rate of travel slowed down considerably. He combined duties as a trader at Fort George (near Lindberg, Alta), Rocky Mountain House, and on the Peace River (Alta) with a number of short surveying trips, three of which took him into the Rocky Mountains in 1800 and 1801. 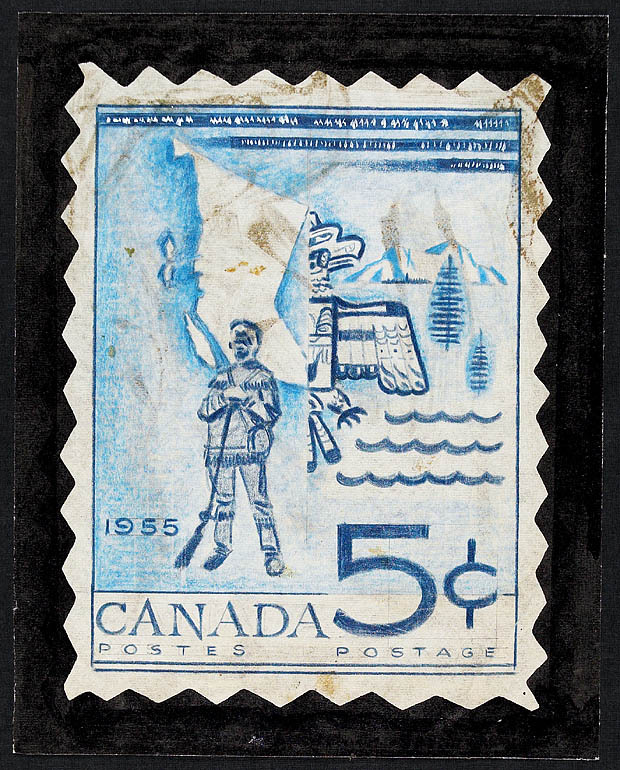 The last of these three expeditions, prepared by Duncan McGillivray*, was an attempt to cross the mountains to establish a direct trade with the Kootenay Indians and, it was hoped, to find an economical route to the Pacific. Accompanied by James Hughes, Thompson travelled up the North Saskatchewan and Ram rivers before being forced back to Rocky Mountain House by the abnormally high waters in the latter river. At the annual meeting at Kaministiquia (Thunder Bay, Ont.) in July 1804, Thompson became a partner in the NWC. The following two years were spent in the Muskrat country, where as a wintering partner he assumed responsibility for managing the trade. He nevertheless found time to expand the surveys he had conducted in the area over a decade earlier. His career as a surveyor might have come to an end with his rotation on furlough in 1808, so dissatisfied was he by 1804–5 at not being able to pursue his interests in exploring and surveying. A change in company plans, however, led him to undertake the explorations for which he is best remembered. After the annual meeting in 1806 Thompson set off for the Rocky Mountains to act upon the observations he had submitted to McGillivray after the failure of the Ram River expedition, observations on the ways in which the failure of a subsequent expedition to the Pacific coast could be avoided. The NWC was concerned about the implications of the successful American overland expedition to the Pacific coast, led by Meriwether Lewis and William Clark in 1806, and was anxious to determine whether the Columbia River could be used as a gateway to its trading territories. Thompson travelled up the North Saskatchewan River with Finan McDonald and eight other men, together with his wife and three children, and, after wintering at Rocky Mountain House, he crossed the height of land on 25 June 1807, through the pass that would later be named for the HBC trader Joseph Howse. The party descended the Blaeberry River (B.C.) to a river which Thompson at first named Kootana, unaware that he had reached the upper Columbia. There over the next three years he extended his trade and surveys throughout the territory of the Kootenay Indians and south into the Flathead country, passing the first two winters at Kootenae House near Lake Windermere, and the third winter at Saleesh House (near Thompson, Mont.). Thompson successfully precluded the expansion by American traders into the area. But in doing so he had seriously undermined the position of the Peigan Indians as intermediaries in the trade across the mountains and created tensions that came to a head in 1810. Thompson left Saleesh House for Montreal in the spring of 1810, intending to take his furlough which had been postponed since 1808. En route he left his wife and children at Fort Bas-de-la-Rivière (Fort Alexander, Man.) with her sister Nancy, country wife of John McDonald* of Garth. Upon his arrival at Rainy Lake (Ont.) on 22 July, however, he received new instructions, was hurriedly resupplied, and was sent back to the Columbia in response to the plans of John Jacob Astor to trade through the Pacific Fur Company in the area west of the Rockies. The exact nature of these instructions is unknown and remains a matter of historical debate. On the one hand, it is possible that Thompson was ordered to reach the mouth of the Columbia before the PFC ship, which was to sail around Cape Horn from New York, in order to establish a prior presence and claim for the NWC. On the other hand, in view of the acceptance by the NWC wintering partners of Astor’s offer of a one-third interest in the PFC venture, agreed to in July 1810 but never ratified, Thompson may simply have been instructed to survey a feasible route across the mountains to the mouth of the Columbia. Once there, he could represent the NWC, ensuring that the Astorians did not cut into the trade already established by the NWC in the interior. The few surviving documents tend to support the latter interpretation. Although Thompson undoubtedly hoped to arrive on the Pacific coast before the Astorians, he was more concerned to consolidate his influence in the interior. Whatever his instructions, Thompson suffered a decisive delay before he even reached the mountains. The Peigan Indians, already restless over the NWC’s trading activities, were in an ugly mood after suffering a stunning defeat earlier that summer at the hands of the Salish. The fact that Finan McDonald and two other NWC clerks left in the Columbia by Thompson had aided the Salish confirmed the Peigans in their resolve to block any further trading from the interior across the mountains. Separated from his canoes, Thompson learned in late September of a group of Peigans above Rocky Mountain House and decided to travel by land to the North Branch (Brazeau) River (Alta). His brigade found itself divided into three groups: some men and horses were waiting for him at the headwaters of the North Saskatchewan, on the Kootenay Plains; the men with the canoes had learned of the Peigan Indians and had turned back to Rocky Mountain House; and Thompson, with William Henry, was encamped 60 miles downstream from there. Thompson was slow in dealing with this situation and it was only with the help of Alexander Henry* the younger that the brigade was pieced together again. After over a month’s delay, Thompson set off at the end of October to cross the mountains by way of the Athabasca River. His decision to make a detour north to the Athabasca was probably not inappropriate under the circumstances. However, in the face of the Peigan difficulties he appears to have been paralysed into inaction for a short time and was slow in making this decision. After a difficult crossing through the previously unexplored Athabasca Pass in the months of December and January, many of his men who had not already left or been sent back deserted, and Thompson awaited the coming of spring with his three remaining men in a rudely constructed hut on the banks of the Columbia near the mouth of the Canoe River (B.C.). He and his men made a canoe out of cedar boards and in April he headed south to Saleesh House. From there, by canoe and on horseback, he made his way to Spokane House (near Spokane, Wash.) and then north to the Kettle Falls on the Columbia. There he built another canoe for the last leg of his journey to the sea. Setting off on 3 July, he proceeded down the river, pausing to treat with the Indians at every village as he passed and to lay claim to a new post at the mouth of the Snake River. On 15 July 1811 he arrived, flag flying, at the PFC’s Fort Astoria (Astoria, Oreg. ), where he found the former Nor’Wester Duncan McDougall* in charge. During his short stay with the Astorians, Thompson appeared to be under the impression that the agreement between Astor and the NWC had been finalized. It is not clear if he learned from them that this was not the case, but at least one of the PFC men at the fort, Alexander Ross, perceived Thompson and his party as competitors. On 22 July Thompson set off back up the Columbia, accompanied by a PFC party under David Stuart. The two groups parted company at the Dalles and Thompson hurried on to the mouth of the Snake River, which he ascended as far as the Palouse River (Wash.) before obtaining horses to ride overland to Spokane House. From that point he returned to the Columbia at Kettle Falls and followed the river upstream back to the Canoe River, thus completing the survey, begun in 1807, of the river from its source to the sea. Thompson crossed the mountains to pick up supplies from William Henry’s post on the Athabasca River and then returned to pass the winter of 1811–12 at Saleesh House. In the spring he retraced his steps and crossed the Rockies for the last time, bound for Montreal and retirement from active participation in the fur trade. The generosity of the NWC towards Thompson in the terms of his retirement suggests the high regard they had for the work he had accomplished. Thompson was granted an annual payment of £100 plus a full share of the profits of the company for three years, during which time he was to compile his observations and prepare maps for the NWC. After that, he was to retire officially from the company and to be granted the usual seven-year allowance of a one-hundredth share of the company’s profits. Upon his arrival at Montreal, one of his first preoccupations was to see to the baptism of his wife and four of their five children, performed at the Scotch Presbyterian Church, Montreal, on 30 Sept. 1812, and to regularize his marriage with Charlotte on 30 October. Over the next 25 years he would go to considerable trouble to provide for the education of all his children. He moved with his family in October 1812 to Terrebonne, where he spent most of the next two years fulfilling his obligation to the NWC. In 1814 he completed a large map of the northwest from Lake Superior to the Pacific which was forwarded to the NWC and hung for many years in the great hall at Kaministiquia, renamed Fort William in 1807. In the fall of 1815 Thompson purchased a farm at Williamstown, Upper Canada, from the estate of the Reverend John Bethune*. There he lived in close contact with a large number of former Nor’Westers including his close friend and brother-in-law John McDonald of Garth. Thompson accepted in January 1817 a position as astronomer and surveyor for the boundary commission created under the 6th and 7th articles of the Treaty of Ghent to determine the precise location of the border with the United States. For five years he was employed on surveys under the 6th article, from Saint-Régis, Lower Canada, on the St Lawrence River to Sault Ste Marie. His role with the commission expanded year by year and after the death in 1819 of John Ogilvy*, the first British commissioner, he was given increasing responsibilities in managing the field operations of the survey crews. Relations between the American and British commissioners and their parties were sometimes cool, but Thompson won the respect of fellow surveyors, scientific observers, and political appointees on both sides. In 1822 agreement was reached on the boundary surveyed under the 6th article, but Upper Canadian opinion widely regarded it as a sell-out of Canadian interests. Both Anthony Barclay, the second British commissioner, and Thompson were subjected to a good deal of personal criticism. For the next four years the commission, with Thompson as its only official astronomer, proceeded with surveys under the 7th article, west from Lake Superior to Lake of the Woods. In 1827 Thompson remained in the employ of the commission, drawing maps and preparing position papers, but the claims of the two governments had become so divergent that no further agreement was possible. 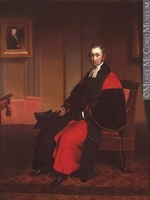 As the work of the commission came to an end, Thompson turned his attentions to his family and to his responsibilities in Glengarry County as a landowner and as a justice of the peace, a commission he had held since 1820. The good fortune that had smiled on him through most of his life now deserted him. He would find no lasting satisfaction either in the accomplishments of his children, eventually numbering seven sons and six daughters, or in his life as a landed proprietor. 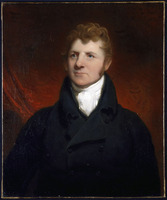 Thompson’s eldest son, Samuel, had assisted him in his surveys and map making since 1820, but now rebelled and turned to other pursuits; by 1831 they had quarrelled bitterly and were no longer on speaking terms. His financial fortunes began to decline in 1825 with the bankruptcy of the NWC agent McGillivrays, Thain and Company [see Thomas Thain*], in which he lost a considerable portion of his life savings. Most of his remaining wealth was invested in land, but attempts in the late 1820s to clear it and bring it into commercial production were costly and unsuccessful. He turned to other activities such as potash production and the operation of two general stores, one at Williamstown in 1830 and the other at Nutfield (near Maxville) in 1831, in order to supplement his income and provide his sons with a livelihood, but these efforts met with similar results. The most disastrous of all his ventures was the contract he accepted to supply the British army at Montreal with cordwood in 1829–30. 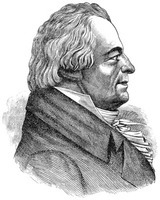 The project was dogged by misfortune from the beginning: labour was expensive and scarce; cordwood obtained from jobbers was too short and therefore unsaleable; rafts ran aground and broke up in the rapids below Coteau-du-Lac, Lower Canada; and finally he was forced to fill the shortfall in his contract with wood purchased at Montreal for prices far higher than he was to receive for it. By 1831 his capital resources had been depleted; two years later he was so deeply in debt that he had to assign his lands to his creditors in order to avoid bankruptcy and, at the age of 63, he was forced to seek employment as a surveyor in order to maintain himself and his family. With his third son, Henry, as assistant, Thompson found fairly steady employment for the next three years carrying out hydrographic surveys for proposed canal projects and exploratory land surveys in the Eastern Townships for the British American Land Company. In 1837 he was employed by the government on a survey of the waterways between Lake Huron and the Ottawa River but continuing resentment in Upper Canada over the boundary decision 15 years earlier damaged his reputation and his findings were shelved. Over the next eight years employment became increasingly sporadic and, between such projects as the mapping of Lac Saint-Pierre and street surveys in Montreal, he was frequently in financial difficulty. He had already moved from Williamstown to a rented house in Montreal. There he was forced to move several times into progressively meaner quarters and on more than one occasion was reduced to pawning his instruments; once he even had to pawn his coat. His desperation was such that in August 1840, at age 70, he unsuccessfully applied for a position as clerk with the HBC. Pleas for pensions or positions in recognition of his past services fell on deaf ears and he found no ready publisher for his maps. He did receive £150 for a new version of his map of the northwest in 1843 from the British government, but the advice he tendered on the Oregon boundary question was largely ignored. Reluctantly, he moved in with his daughter and son-in-law, in 1845 in Montreal and in 1850 in Longueuil. In the small whitewashed rooms he shared with his wife in Longueuil, Thompson wrote an account of his travels in North America. This work of his final years is in many ways his greatest achievement, but he never had the satisfaction of seeing it completed and published. Already in 1848 the sight in his remaining good eye had begun to fail; by 1851 he was completely blind and the manuscript remained unfinished. Through all these years of misfortune, Thompson retained his strong religious convictions and his belief in the ultimate goodness of Providence, and he found solace and support in the unfailing care of his wife. 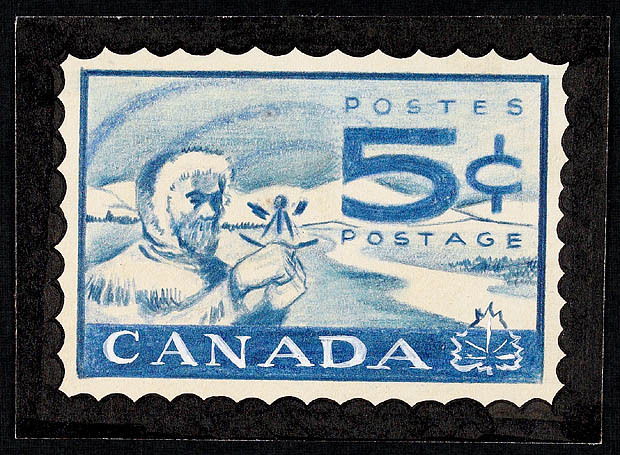 His death in 1857 went almost unnoticed outside the circle of his own family, and his true stature as one of Canada’s greatest explorers and geographers was completely unrecognized until Joseph Burr Tyrrell* began his campaign in the 1880s to give him his due. It was only when Tyrrell obtained the manuscript in the 1890s and edited it for publication by the Champlain Society in 1914 that David Thompson’s narrative, covering Thompson’s career up to his retirement in Montreal in 1812, became public. The Narrative, somewhat flawed because it was written so long after the events, remains a major work of autobiography and an invaluable source for historians. By 1927, the 70th anniversary of Thompson’s death, when special ceremonies were held in Montreal to unveil a monument on his previously unmarked grave, David Thompson had become one of Canada’s best-known and loved historical figures. David Thompson’s manuscript was published as David Thompson’s narrative, ed. J. 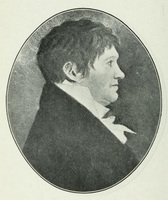 B. Tyrrell (Toronto, 1916); a new edition, prepared by R. [G.] Glover (Toronto, 1962), was later abridged and published with some additional material as Travels in western North America, 1784–1812, ed. V. G. Hopwood (Toronto, 1971). A few of the journals he wrote in the course of his expeditions, which are at AO, MS 25 and MU 2982, have been published as “David Thompson and the Rocky Mountains,” ed. J. B. Tyrrell, CHR, 15 (1934): 39–45; “David Thompson on the Peace River,” ed. H. A. Dempsey, Alberta Hist. Rev. 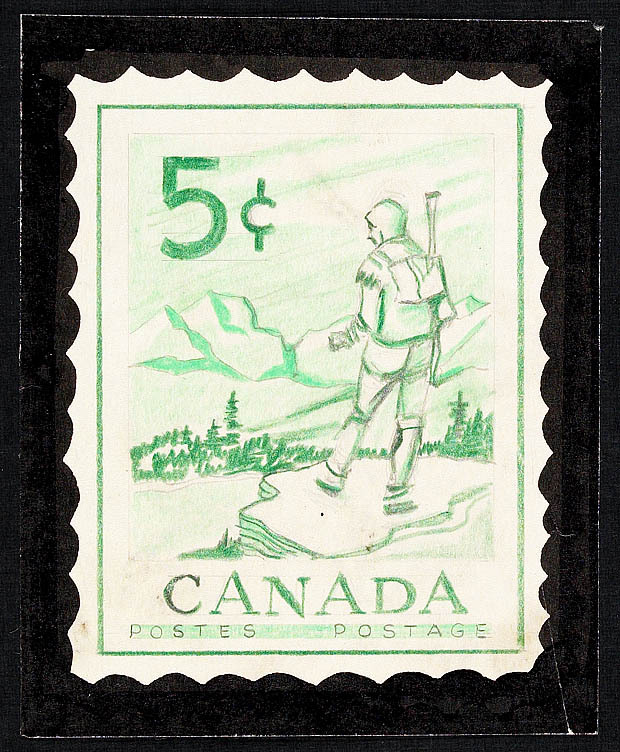 (Edmonton), 14 (1966): 1–10; “David Thompson’s account of his first attempt to cross the Rockies,” ed. F. W. Howay, Queen’s Quarterly (Kingston, Ont. ), 40 (1933): 333–56; David Thompson’s journals relating to Montana and adjacent regions, 1808–1812, ed. M. C. White (Missoula, Mont., 1950); “David Thompson’s journeys in Idaho,” ed. T. C. Elliott, Wash. Hist. Quarterly, 11 (1920): 97–103, 163–73; “David Thompson’s journeys in the Pend Oreille country,” ed. T. C. Elliott, Wash. Hist. Quarterly, 23 (1932): 18–24, 88–93, 173–76; “David Thompson’s journeys in the Spokane country,” ed. T. C. Elliott, Wash. Hist. Quarterly, 8 (1917): 183–87, 261–64; 9 (1918): 11–16, 103–6, 169–73, 284–87; 10 (1919): 17–20; and “The discovery of the source of the Columbia River,” ed. T. C. Elliott, Oreg. Hist. Quarterly (Eugene), 26 (1925): 23–49. Part of Thompson’s work as surveyor on the boundary commission was published as “Remarks on the maps from St. Regis to Sault Ste. Marie,” OH, 1 (1899): 117–21, and his comments on the Oregon boundary question appeared as “Letters and reports relating to the Oregon Territory,” PABC Report (1913): 112–25. A few of his letters can be found in “Some letters of David Thompson,” ed. L. J. Burpee, CHR, 4 (1923): 105–26. ANQ-M, CE1-63, 14 févr. 1857, 7 mai 1857; CE1-126, 30 sept. 1812. PAC, MG 19, A17; MG 30, D49. PAM, HBCA, A.1/46–47; A.5/2–3; A.6/3: ff.128d–29; A.6/13–15; A.11/116–17; A.16/33–34; A.21/1; B.14/a/1; B.24/a/1–6; B.49/a/17–25; B.55/a/1; B.87/a/8–9; B.121/a/1–8; B.178/a/1; B.205/a/1–8; B.239/a/86–99; B.239/b/45–59; B.239/f/1. Les bourgeois de la Compagnie du Nord-Ouest (Masson), vol.2. Can., Prov. of, Legislative Assembly, App. to the journals, 1842, 2, app.Z. Cox, Adventures on the Columbia. [Joseph Delafield], The unfortified boundary: a diary of the first survey of the Canadian boundary line from St. Regis to the Lake of the Woods, ed. Robert McElroy and Thomas Riggs (New York, 1943). Docs. relating to NWC (Wallace). Gabriel Franchère, Journal of a voyage on the north west coast of America during the years 1811, 1812, 1813, and 1814, trans. W. T. Lamb, ed. and intro. W. K. Lamb (Toronto, 1969). HBRS, 26 (Johnson). “Journals of Legislative Assembly of U.C.,” AO Report, 1914: 1–690. “The journals of the Legislative Council of Upper Canada . . . [1821–24],” AO Report, 1915: 1–286. Muskoka and Haliburton, 1615–1875; a collection of documents, ed. F. B. Murray ([Toronto], 1963). New light on early hist. of greater northwest (Coues). A. Ross, Adventures on the Columbia. Illustrated historical atlas of the counties of Stormont, Dundas and Glengarry, Ont., comp. H. Belden (Toronto, 1879; repr., Owen Sound, Ont., 1972). M. W. Campbell, The North West Company (Toronto, 1973). H. G. Classen, Thrust and counterthrust: the genesis of the Canada–United States boundary (Don Mills [Toronto], 1965). 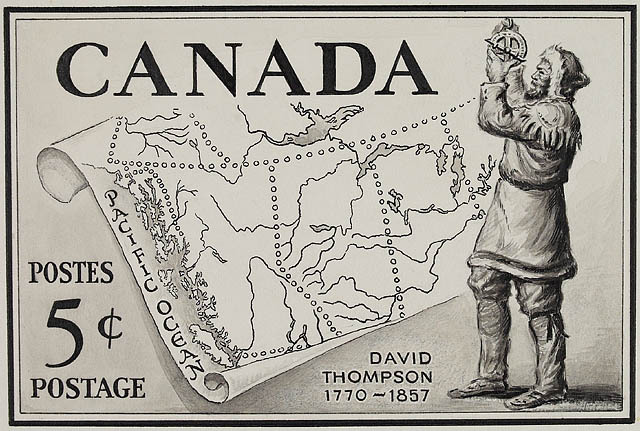 C. N. Cochrane, David Thompson, the explorer (Toronto, 1924). David Thompson sesquicentennial, 1809–1959, symposium, Sandpoint, Idaho, August 29, 1959, ed. R. N. Cheetham (Sandpoint, ). A. M. Josephy, “David Thompson,” The mountain men and the fur trade of the far west . . . , ed. L. R. Hafen (10v., Glendale, Calif., 1965–72), 3: 309–37. D. [S.] Lavender, Winner take all: the trans-Canada canoe trail (New York and Toronto, 1977). A. S. Morton, David Thompson (Toronto, ). J. S. Nicks, “The Pine Island posts, 1786–1794: a study of competition in the fur trade” (ma thesis, Univ. of Alberta, Edmonton, 1975). Old trails and new directions; papers of the third North American Fur Trade Conference, ed. C. M. Judd and A. J. Ray (Toronto, 1980). Rich, Hist. of HBC. J. K. Smith, David Thompson: fur trader, explorer, geographer (Toronto, 1971). D. W. Thomson, Men and meridians: the history of surveying and mapping in Canada (3v., Ottawa, 1966–69), 1. J. B. Tyrrell, A brief narrative of the journeys of David Thompson, in north-western America . . . (Toronto, 1888). Van Kirk, “Many tender ties.” J. N. Wallace, The wintering partners on Peace River from the earliest records to the union in 1821; with a summary of the Dunvegan journal, 1806 (Ottawa, 1929). John Warkentin, The western interior on Canada, a record of geographical discovery, 1612–1917 (Toronto, 1964). “David Thompson monument,” CHA Report, 1927: 9–16. R. [G.] Glover, “The witness of David Thompson,” CHR, 31 (1950): 25–38. Arthur Hawkes, “Montreal honors on Monday man she starved 90 years ago,” Montreal Daily Star, 21 May 1927: 21. J. M. Hitsman, “David Thompson and defence research,” CHR, 40 (1959): 315–18. [W. L. MacIlquham], “Memorial to David Thompson,” Journal of the Dominion Land Surveyors’ Assoc. 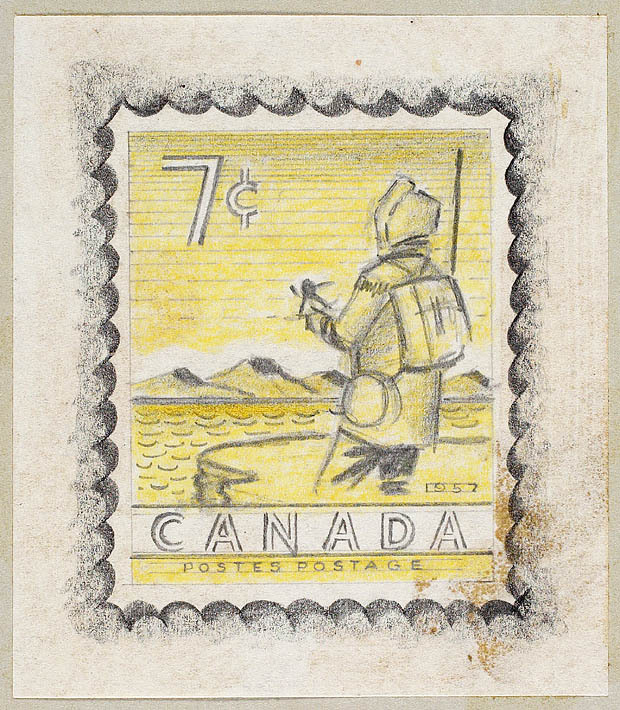 (Ottawa), 1 (October 1922): 2–3. I. E. MacKay, “The David Thompson memorial,” Canadian Magazine (Toronto), 60 (January 1923): 223–29. A. S. Morton, “Did Duncan M’Gillivray and David Thompson cross the Rockies in 1801?” CHR, 18 (1937): 156–62; “The North West Company’s Columbian enterprise and David Thompson,” CHR, 17 (1936): 266–88. Elizabeth Parker, “Early explorers of the west – David Thompson,” Canadian Alpine Journal (Winnipeg), 29 (1946): 216–28. J. S. Plaskett, “The astronomy of the explorers,” BCHQ, 4 (1940): 63–77. R. I. Ruggles, “Hospital boys of the bay,” Beaver, outfit 308 (autumn 1977): 4–11. H. D. Smiley, “The dalliance of David Thompson,” Beaver, outfit 303 (winter 1972): 40–47. W. M. Stewart, “David Thompson’s surveys in the north-west,” CHR, 17: 289–303. Toronto Star Weekly, 28 May 1927. J. B. Tyrrell, “David Thompson and the Columbia River,” CHR, 18: 12–27; “The rediscovery of David Thompson,” RSC Trans., 3rd ser., 22 (1928), sect.ii: 233–48. John Nicks, “THOMPSON, DAVID (1770-1857),” in Dictionary of Canadian Biography, vol. 8, University of Toronto/Université Laval, 2003–, accessed April 21, 2019, http://www.biographi.ca/en/bio/thompson_david_1770_1857_8E.html.